For other uses, see Pedra Branca. An artist's impression of Pedra Branca and Eddystone, 1823. Pedra Branca is known for its inaccessibility, rich marine wildlife, wet and windy weather, interesting geology and large waves. With an area of 2.5 hectares (6.2 acres), the island is small enough to provide an example of an outcrop that lies on the border between being a rock or islet and an island. The geology features three breccia cones of dolerite and sandstone. The only plant species found on the island is the succulent Sarcocornia quinqueflora. Recorded breeding seabird species include fairy prion, Pacific gull, silver gull, kelp gull, black-faced cormorant, Australasian gannet, and shy albatross. Australian fur seals use the island as a regular haul-out site while New Zealand fur seals visit occasionally. Remarkably, the tiny, windswept island is the only known habitat of a species of lizard, the Pedra Branca skink, Niveoscincus palfreymani. An estimated 400 individuals survive, but the species is listed as vulnerable. Together with the nearby Eddystone and Sidmouth Rock the island constitutes the 2-hectare (5-acre) Pedra Branca Important Bird Area (IBA), identified as such by BirdLife International because it supports over 1% of the world populations of shy albatrosses and Australasian gannets. Abel Tasman led the first known European expedition to sight Tasmania. His journal entry for 29 November 1642 records that he observed a rock which was similar to a rock named Pedra Branca off China, presumably referring to the Pedra Branca in the South China Sea. 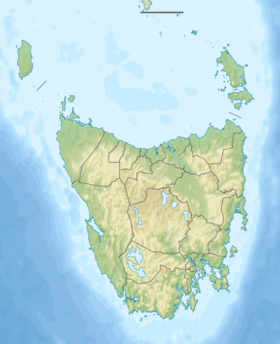 The journal places Pedra Branca "about four [Dutch] miles" from the mainland of Tasmania; a Dutch mile from this period was about 5.8 kilometres (3 5⁄8 mi), thus 4 such Dutch miles would be 23 kilometres (14 mi), which is close to the actual distance of Pedra Branca from South East Cape. On 7 February 1973 Nisshin Maru No. 8, a Japanese steel fishing vessel of 258 tonnes (254 long tons) led by Captain Nakayama, on its way to Hobart for a mechanical inspection, hit Pedra Branca and sank in deep water within a few minutes. In the ensuing confusion only one of the crew of 22, engineer Yoshiichi Meguro, managed to clamber onto the rocks and escape drowning. The fishing vessel Walrus rescued the survivor. The Nisshin Maru No. 8 disaster led to considerable improvements in communications between the various authorities that should have been able to mount a rescue operation many hours before this one was commenced. These included direct links between Japanese fishing boats and Australian shore stations, and correcting the inability of fishing vessels to directly contact warships and military aircraft, as they were unable to contact the Hobart emergency radio station which did not operate at night. Weather conditions in the area can be extreme, and Pedra Branca is occasionally swept by freak waves. On 15 April 2003, oceanographer Hamish Saunders drowned after being washed off Pedra Branca. The Tasmanian Coroner's report  includes testimony from three witnesses who described how Saunders was swept away when a "wave hit the island resulting in heavy spray coming up to and over the 45-metre (148 ft) level". Waves were measured that day at up to 13.8 metres (45 ft) by the Cape Sorell Waverider Buoy, some 100 kilometres (62 mi) away. Pedra Branca is Portuguese for "white rock". According to historian Kenneth McIntyre, Pedra Branca is one of only two Australian places with a name of Portuguese origin, the other being the Houtman Abrolhos islands in Western Australia. Pedra Branca is home to a big wave surf break at a reef approximately 40 km offshore. Marty Paradisis was the first person to surf it. later, In 2008 Ross Clarke-Jones and Tom Carroll joined local surfers Marti Paradisis and brothers James and Tyler Hollmer-Cross to shoot a story about it which was featured on 60 Minutes. On 1 January 2016, a picture of Pedra Branca with seals and birds chasing fish, was the worldwide feature photograph for National Geographic. The picture was taken in late 2015 by Andy Chisholm who was among a group of surfers who had gone to surf and photograph the big waves. Another surfer, James Hollmer-Cross, was wiped out by a wave, broke his leg in two places, perforated an ear drum, tore a knee ligament and suffered a compression fracture in his shin bone. ^ "Pedra Branca (TAS)". Gazetteer of Australia online. Geoscience Australia, Australian Government. ^ "Pedra Branca (N/A)". Gazetteer of Australia online. Geoscience Australia, Australian Government. ^ a b "Pedra Branca Skink". Tasmania Parks and Wildlife Service. pp. 563–569. Retrieved 16 July 2006. ^ a b c "Small Southern Islands Conservation Management Statement 2002" (PDF). Tasmania Parks and Wildlife Service. 2002. Archived from the original (PDF) on 22 August 2006. Retrieved 16 July 2006. ^ Brothers, Nigel; Pemberton, David; Pryor, Helen; Halley, Vanessa (2001). Tasmania's Offshore Islands: seabirds and other natural features. Hobart: Tasmanian Museum and Art Gallery. ISBN 0-7246-4816-X. ^ "IBA: Pedra Branca". Birdata. Birds Australia. Archived from the original on 6 July 2011. Retrieved 2011-09-16. ^ Heeres, J. E., ed. (2006). "Abel Janszoon Tasman's Journal of his Discovery of Van Diemen's Land and New Zealand in 1642 with Documents Relating to his Exploration of Australia in 1644...to which are added his Life and Labours, 1898". Project Gutenberg of Australia. Retrieved 9 July 2006. ^ Coroner (2004-11-05). "Drowning 15th April 2003 of Hamish Alan Saunders". Coronial Findings. Magistrates Court of Tasmania. Archived from the original on 27 April 2006. Retrieved 5 June 2006. ^ McIntyre, Kenneth (1977). The secret discovery of Australia. South Australia: Souvenir Press. ISBN 0-285-62303-6.